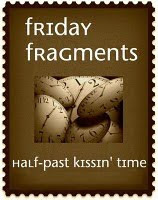 Do you know about Mrs. 4444 and Friday Fragments? ***I can't believe I forgot to mention here that the PTO Magazine article, featuring yours truly, is up! I was really pleased on how it turned out, and I hope that it benefits schools and their families. ***Homework hasn't been too bad since the other night. And Riley is excited to do her diorama book report, of all things. Hey, whatever makes you happy, kid. ***We're already planning our next trip. It's in Arizona for a family anniversary, but it gives me an excuse to hang out with Nat and her family so we're excited about that. And the girls are excited to go to another state. ***I haven't done any budgeting this year yet, but I'm pleased to say that I'm doing much better fiscally right now than I thought I would. ***I put pics of our trip up on FB. ***I'm excited that the girls are now old enough to come with me to DreamDinners. We have our first family outing there tomorrow. I'm thinking it will be hectic the first couple of times, but then it'll be nice to have help! ***Even though I've ranted quite a bit here this week, I'm really fine. The beauty of blogging: having this avenue really helps me to get it all out and then move on with my life. ***I watched Julie & Julia last night, and was struck by this impression that seems to be ubiquitous these days that blogging is a form of narcissism. While I can certainly see how it could be used in that manner, I'm having a hard time believing that all bloggers are narcissists. A separate post on this may be forthcoming. Ha, we don't have a three day weekend that day! I believe this is the holiday we gave up in order to have the day after Thanksgiving off. No matter, I am tired of three day weekends! Wow! You have been in a posting spree this week. The time off must have been good for you soul. I haven't seen Julie & Julia yet, but I hate that people think blogging is a form of narcissism. I guess it could be seen that way... but it's more of a community. A sharing of thoughts. Anyway, I'll shutup. Can't wait to hear your thoughts on it. I'm looking forward to your narcissism post. Sometimes I feel like I'm navel-gazing by blogging, but 95% of the time I'm writing because I want to, and because it's a way of participating in the awesome community that I've found online. I love sharing with my "bloggy friends," hearing their feedback, reading about their lives, and all the other things that make blogging more about community than about mememe. That said, I liked the Julia part of the movie much better than Julie. Meryl Streep is amazing. I'm pretty sure it's only non-bloggers who would call bloggers narcissists. Like Cat and Jenn pointed out, what we blog about isn't about being self-focused but more about connecting with others. I loved Julie & Julia! I think of blogging as more of a creative outlet than a "HEY LOOK HOW COOL I AM" although, sometimes I do tell people how cool I think I am at the moment. But of COURSE we're all narcissists, all the cool kids are :)! I loved Julie & Julia, as I think it actually captures the way a lot of blogs start...an idea, an outlet - and she was looking for something to help her out of a rut. Look where it got her, seriously! But I agree with another commenter, unless you blog, you just don't get it. I'm looking forward to your post on blogging. If by talking about yourself you help people understand their world, how is that narcissistic? Your posts are certainly not narcissistic--I have never once read a post wherein you discuss your bellybutton.